We’ve been trying to be as prepared for school this year as we can be. This is the first year in the last five that my kids haven’t had to wear uniforms to school, and we are all looking forward to it. This is also the first year in the last many, many years that I have six kids going back to school at the same time. 6 is a big number so I have to try to save money where I can. 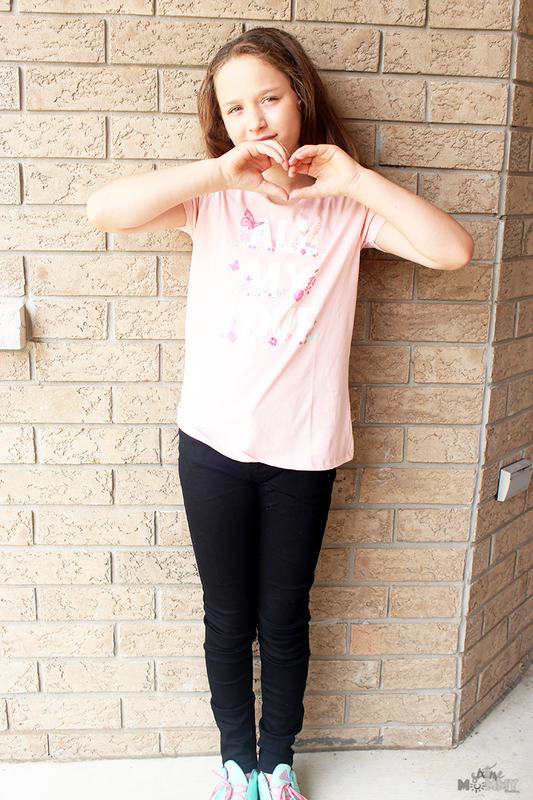 I was thrilled when Sears Canada reached out to collaborate with me on this post and help us stay on a budget for Back-to-School clothes! 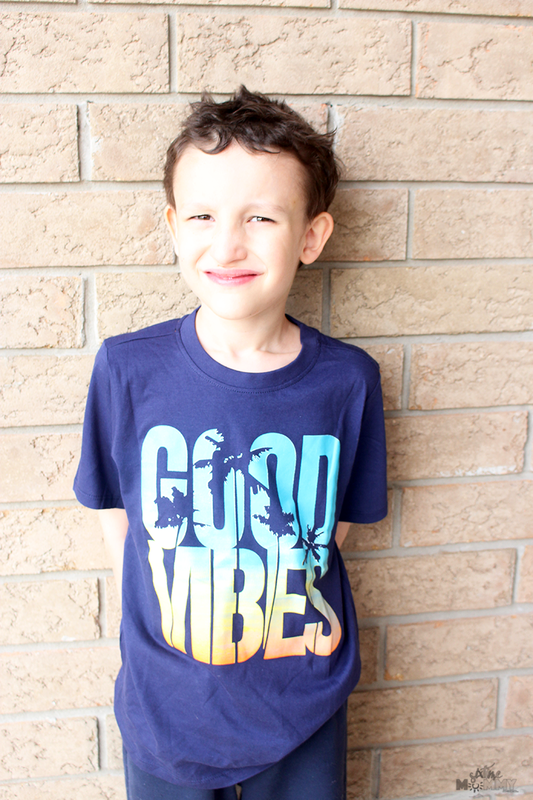 I am very thrifty, I don’t like to spend a lot of money if I don’t have to and Sears Canada made it very easy to find fantastic deals, and make multiple outfits for less than I’ve ever spent on Back-to-School stuff before. 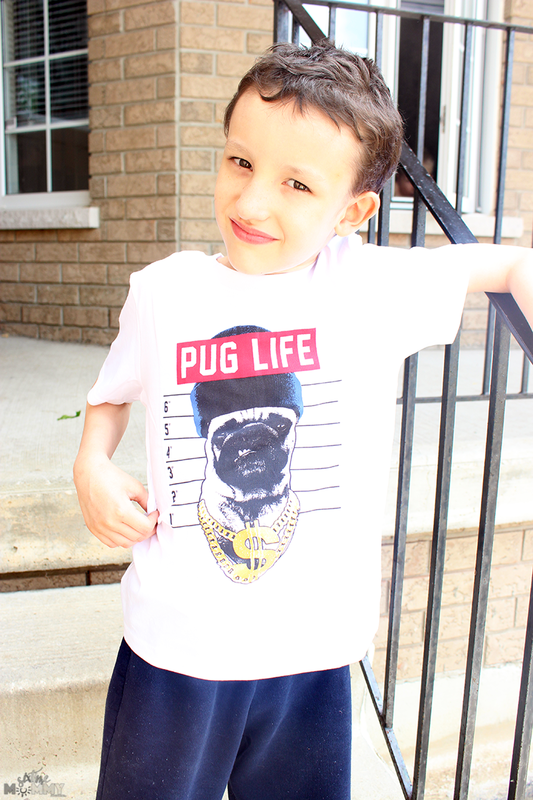 Shirts being $3.97 was a lifesaver, and I was able to stock the kids up on tons of new shirts. Pants were also very cheap, but I couldn’t find all the sizes I needed, so some children didn’t get quite as much. 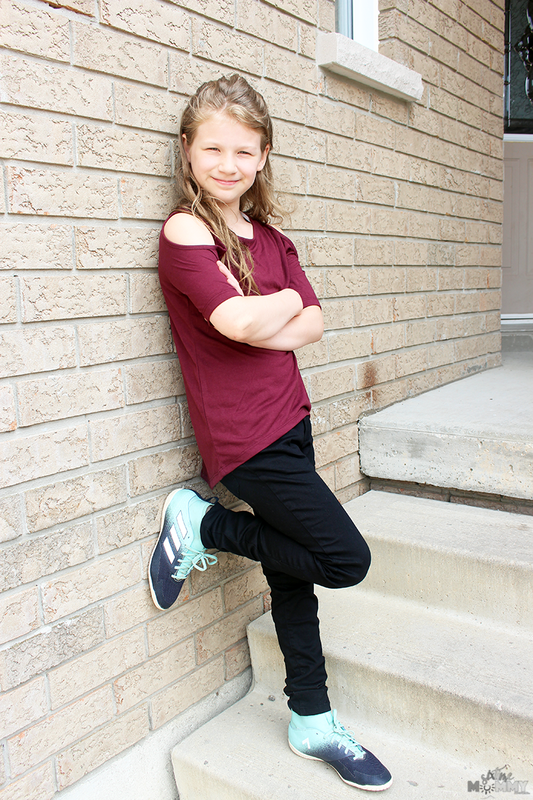 We spent $300 on back-to-school clothes and chose two outfits each to share with you to show you what quality, and stylish clothes you can get at Sears Canada for a fraction of the cost I’ve seen at other stores! First up, Justin! This is his first year going to school. 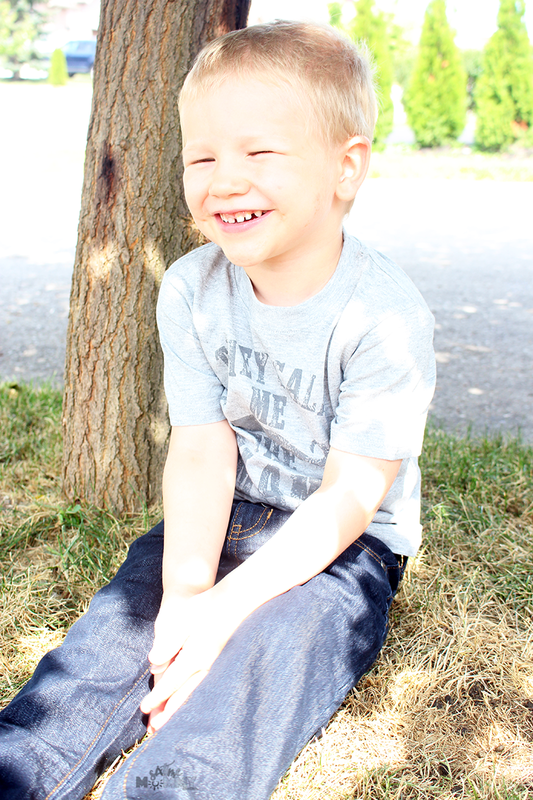 He’s starting Junior Kindergarten a few days after the other kids go back, and can’t wait to go! His first outfit is a Little Boys’ Graphic Tee for only $3.97, and his jeans are Little Boys’ Slim Straight Fit Denim Jeans for $12.97. 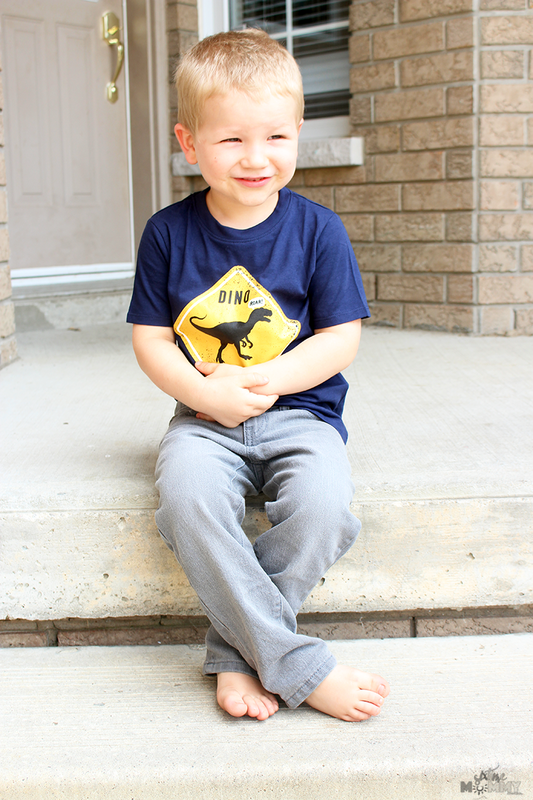 He is excited to be sporting a dino tee to school. He can’t wait to “show my friends!” how he looks. 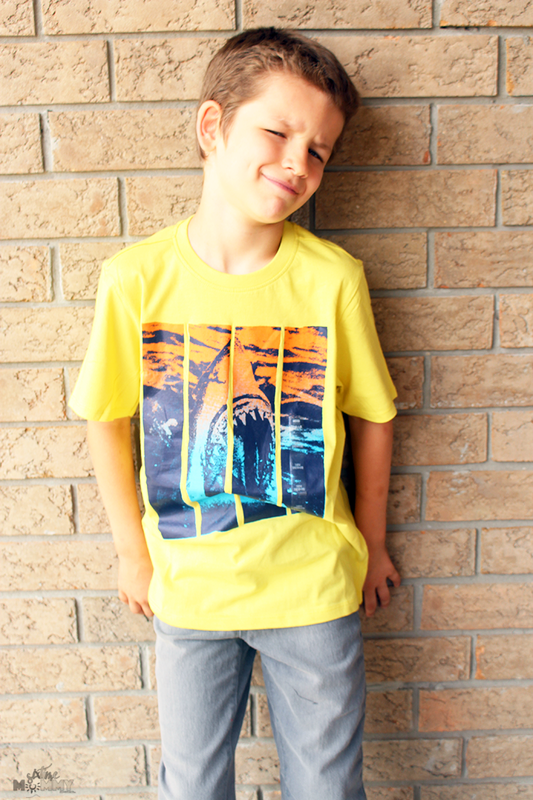 His second outfit is another Little Boys’ Graphic Tee for again $3.97, and the jeans are the same as above Little Boys’ Slim Straight Fit Denim in a darker blue colour for $12.97. Both of his outfits cost a whopping $33.88 before tax! Talk about a steal. How cute do little kindergarteners look in denim? Next up is Ava! She had so much fun looking through Sears.ca picking out all the clothes she wanted for back-to-school! Ava is excited about this Big Girls’ Cold Shoulder Knit Top which was $16.97 and her gorgeous Big Girls’ Core Denim Skinny Jean in black which was $14.97! In style fashions and great prices – My girls had such a blast picking out their outfits! 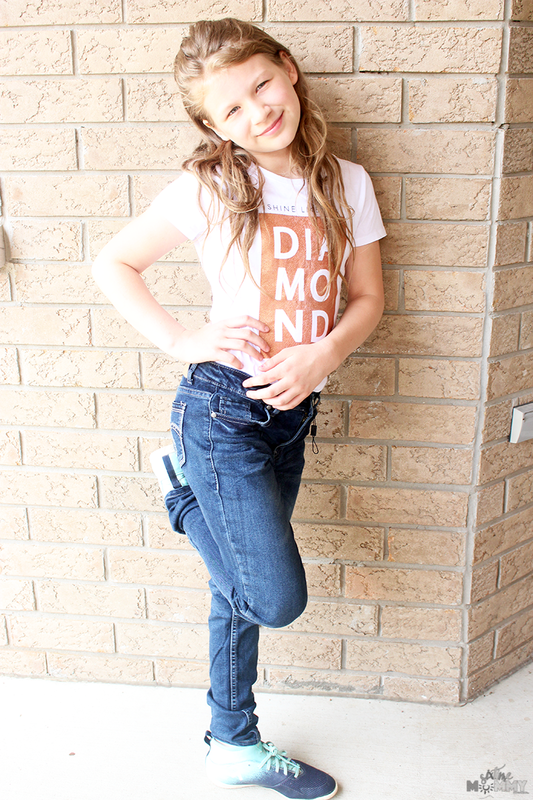 For her second outfit, Ava is rocking a Big Girls’ Short-sleeve Graphic Tee which was also an incredible $3.97 and another pair of Big Girls’ Core Denim Skinny Jean in medium blue which was $14.97! Ava’s outfits cost a total of $50.87 before taxes! Two full outfits for a 10-year-old under $51! Total Score. Jayden loves his clothes. He has his style and is very picky when it comes to clothes. Demin and tees were what we stuck with for him, and he is thrilled. Jayden’s style is reflected here in this first outfit. With a Big Boys’ Short-Sleeve Crew Neck Tee at again $3.97 and Big Boys’ Slim Straight fit Denim in Black for $14.97! His second outfit is pretty much the same, as it’s what he feels comfortable in and he loves it! Another Big Boys’ Short-Sleeve Crew Neck Tee for $3.97 and the same pair of Big Boys’ Slim Straight Fit Denim in grey for $14.97! Jayden’s two outfits cost $37.88 before taxes! He got two more and is thrilled that he’s set and comfortable for school! Kyla is picky when it comes to back-to-school clothes. She has her style that she loves and is comfortable in, but it was easy to find her what she loves at Sears. Kyla got the same Big Girls’ Cold Shoulder Knit Top as Ava but in black for $16.97! She also got this great fitting pair of Big Girls’ Core Denim Skinny Jean in medium blue for $14.97! For her second outfit, Kyla was thrilled to have another pair of Skinny Jeans, this time in black! Kyla’s shirt is another gorgeous $3.97 Big Girls’ Short-sleeve Graphic Tee and the jeans are Big Girls’ Core Denim Skinny Jean for $14.97! Kyla’s two outfits too cost a whopping $50.87 before taxes! We got the girls a bunch more extra shirts too. How can you not with a deal like $3.97! Talk about a steal. Speaking of shirts costing $3.97 I had to pick Jackson up some! We couldn’t find any pants that were in stock in his size, so he got five shirts, here are two of them in size 6x for little Jackson! Thankfully Sears Canada has lots of graphic tees, and pants/denim to choose from. If you are on a budget like us, or just looking to save some extra money and get more clothes for your buck Sears Canada has you covered. Want a little help buying all those back-to-school threads? Well, Sears Canada and Six Time Mommy has you covered! One (1) Lucky Six Time Mommy reader will win a $300 Sears Canada Gift Card! This giveaway is open until 9/6. Winner will be chosen at random and emailed. The Winner will have 24 hours to respond to the winner email before a new winner will be chosen! Disclosure: This post is in partnership with Sears Canada. As always, opinions are all my own.